If you find yourself at the National Portrait Gallery, or even if you're nearby, you can take advantage of its free admission policy. Whilst there you could pop downstairs to the bookshop gallery and look at the photos of Mick Jagger in his younger days in the 1960s. Those of us who have grown up with the Rolling Stones and all the other musicians from that decade are probably aware that we've all got older together, whilst the younger age group may not realise how much some of our ageing rockers have changed over the years. 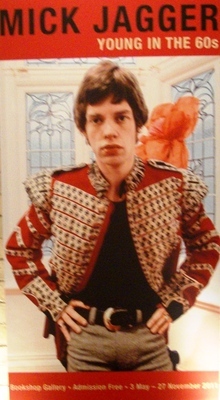 I was even surprised to be reminded that Mick was rather good looking, in a boyish kind of a way, back then. 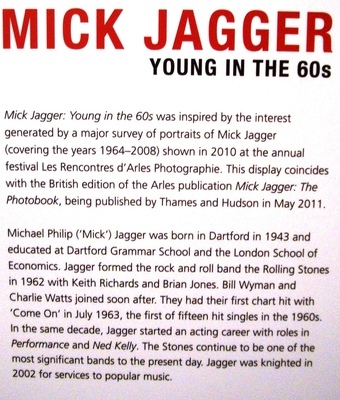 The exhibition opened in May at the same time as the illustrated book Mick Jagger: The Photobook. The first photograph in the collection was one taken of Mick by Cecil Beaton in Morocco in 1967 (and donated to the gallery in 1972) and it has been joined by the band's first official photo shoot as well as the album covers for Their Satanic Majesties Request and Beggar's Banquet. Mick, or Sir Michael Jagger, may not be young any longer and is now in his own sixties, but the exhibition is a reminder of how so many musicians from nearly fifty years ago are still performing and selling music. And to think that my parents used to tell me that the Beatles, the Stones et al were just flashes in the pan!